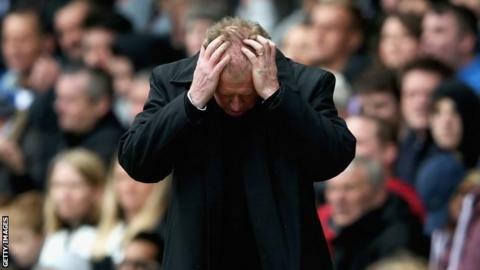 Steve McClaren turned down the chance to become Newcastle United manager for the final three matches of the season. The Derby boss, 54, was approached after Newcastle's 3-0 loss to Leicester on Saturday but the Magpies have since decided to stand by John Carver. McClaren has told officials at the Championship club that he will not leave for Newcastle this summer, BBC Radio Derby reports. Carver, 50, did not offer to resign over the weekend, nor was he asked to. Senior players held talks with Newcastle managing director Lee Charnley in the past 24 hours and accepted they must come together as they try to secure the club's Premier League status. The Magpies, in 15th place, are only two points above the bottom three after a run of eight consecutive league defeats, their worst form since 1977. Between 23 August and 15 October 1977 they lost 10 successive league games in the old Division One. They host West Brom on Saturday and also face QPR away on 16 May and West Ham at home on 24 May. Carver has also spoken to defender Mike Williamson, whom he accused of deliberately getting sent off against Leicester, in an effort to repair their relationship. Williamson denied the claim. Newcastle released a statement on Monday confirming Carver would continue as manager. Former England boss McClaren has been high on Newcastle's list of candidates since Alan Pardew left for Crystal Palace in December. Carver, Pardew's former assistant, took over at the end of 2014 with the club 10th in the table but has won only two of 17 games in all competitions. Derby's season, meanwhile, is over after their failure to reach the Championship play-offs after a run of two wins in their last 13 games.